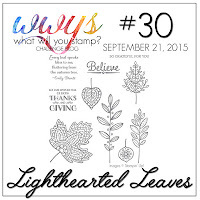 Lighthearted Leaves has been one of my new favorites from the 2015 Holiday Catalog. If you've followed my blog I'm sure you realize that as I've posted quite a few card with this awesome stamp set already! On this card I started with an A2 Mossy Meadow Cardbase. I used watercolor paper for my next layer and did a base of Pumpkin Pie and Old Olive for the background. I heat embossed my leaves onto Shimmery White cardstock with White embossing powder. I then used daubers to sponge on Old Olive, Hello Honey, Pumpkin Pie, and Cajun Craze Inks. I used a paper towel to rub off any ink that was on the white embossing and then cut the leaves out using the Leaflet Framelits. I looped some Linen thread onto my background and then adhered the leaves with Stampin' Dimensionals. I tied the leaves together at the bottom with some more Linen Thread. The sentiment was a watercolor wash background that was stamped with Cajun Craze Ink. Amazing, amazing! Everything about this is fantastic!! I love the emboss resist paired watercoloring in bold color choices. Great card! Beautiful card! These leaves look so good embossed!! !